ATLANTA, Ga. --- The cloud of mystery hanging over Tom Brady's Super Bowl LI jersey lifted today. The jersey which had gone missing soon after the New England Patriots won the Super Bowl turned up today at an Adventist thrift store in Atlanta. The now-famous jersey was about to be put out on display with other $7-or-less jerseys at Atlanta's Adventist Community Services thrift store. James White, the manager of the store said that he did a double take as he dusted off the jersey to hang it on a rack. "I had to pinch myself to make sure I wasn't in vision," said White who decided to be a good Adventist, do his honest part and call the Patriots to report his find. "Tom Brady himself was in our store by lunch time," said White shaking his head in disbelief. White said that he returned the jersey free of charge to a grateful Brady who in turn made a $144,000 donation to the thrift store. 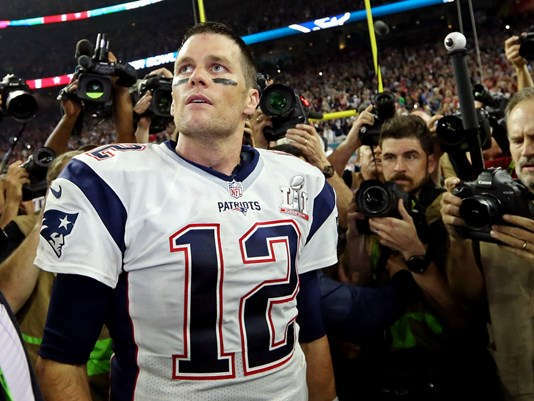 "The only thing Tom got mad about was that the jersey had been donated anonymously to us so there was no easy way to trace it to whoever took it from the Patriots' locker room," said White. "He vowed to visit Adventist churches until he finds the culprit." I have this on good authority: Sevvy is a Jesuit. Possible, but unlikely. He gave birth to a baby last year, which is half Danish, half Swedish, and half Filipino. Trump is biblical. “In a moment, in the twinkling of an eye, at the last Trump.” 1 Corinthians 15:52. Auction off the jersey and use the proceeds for the next Pathfinder Jamboree in Oshkosh. Also, the winning bidder must show off the jersey in one of the big hangers. I’ll be glad to pay $5.00 to see it and take a selfie. Better yet, make about 25,000 copies or knock/offs of the jersey. Sell them for a few bucks and you got yourself a winner. I wear LARGE. See the number 12 on the jersey?? It’s a Biblical number-12 apostles, 12 tribes, 12 fruit of the Spirit, 12 gates to New Jerusalem, 12 spies, 12 minor prophets, 12 fruit on the Tree of Life, etc. What a great marketing tool. Let’s get some ready for Camp Meeting, 2017 Junior Camps, the next 2020 GC, 2019 Camporee & local Camporees, get them on a shelf at the ABC, team up with Little Debbie. I wear a large.